Review date: 26 June 2003. 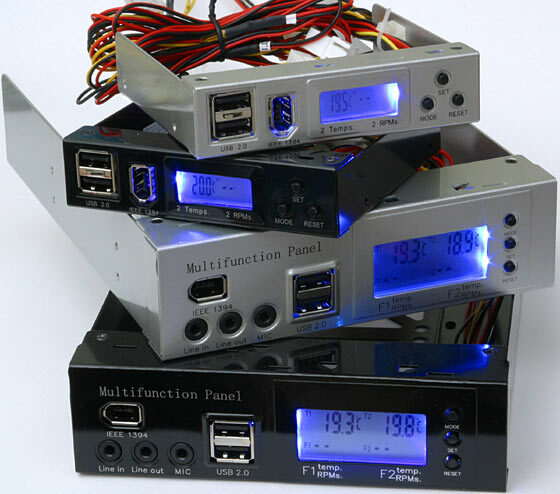 Multiple function gadgets that install in a drive bay and give you front panel sockets for peripherals, and temperature displays, and fan speed displays, and so on, are quite popular. Some of the people who buy them actually need them. Some of the people who buy them just want to make their computer look more impressive. Front ports, light-up LCD readout, little buttons? What does it do? Who cares? Sold! People in either category may be interested by these devices. One three-channel fan speed controller; four fan speed and temperature monitors. All made from aluminium, all with front ports, all at a pretty reasonable price. The packaging for all of these things is adorned with a "GTR" sticker, proclaiming them to be another fine product from the international mega-brand "Genteelord International Limited". Who knows where the things are actually made; Genteelord are just rebadgers. If you see some bay-gizmoes that look like these ones, then they very probably are these ones. Here in Australia, you can buy the GTR-stickered versions from Aus PC Market. The Multi-Function Panels come in black and silver, all with a lacquered finish that won't quite match fancy brushed-metal cases, but will match cheaper cases, and looks good enough for the money. 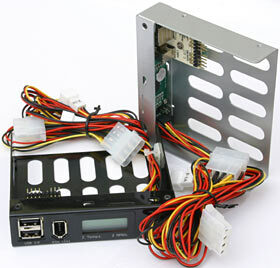 There are versions for 3.5 inch and 5.25 inch drive bays; the 5.25 inch ones have room for a couple more functions. All of the panels have one IEEE-1394 (FireWire) port on the front, and two USB ports. The ports are all fed by loopback cables that have to plug in to ports on the back of your computer (or on the inside, if you've got a FireWire adapter with an internal socket). The loopback cables come with the Panels, and you also get a rear slot cover with a cutout in it to accommodate them. 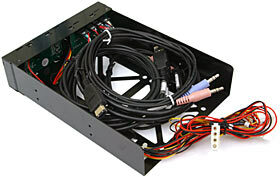 The cables are about 95cm long (with about 90cm of actual flexible cable), which should be enough to accommodate most cases without forcing you to stretch the cables like violin strings over your video card. In case I forget to mention it later, you also get a baggie of mounting screws. All of the panels also have an LCD display, side-lit by blue LEDs, and three little control buttons - Mode, Set and Reset. That's the full front panel feature list for the 3.5 inch Panels, but that's fair enough; there's not much room for more stuff. Here's one of the 3.5 inch Panels with its loopback cables attached. 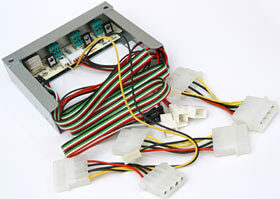 The other bundle of wires, which is already plugged into the Panel when you take it out of its packaging, has a four-pin passthrough-plugged power cable (so you don't need a spare power supply plug to run the Panel), two three-pin sockets for connecting fans, and two temperature probes. The power lead is only around 25cm in length, but that's enough; you'll probably be tucking it into the back of a nearby hard drive, or something. The fan wires stretch about 50cm from the front of the Panel; the thermal probe wires are about a metre long. 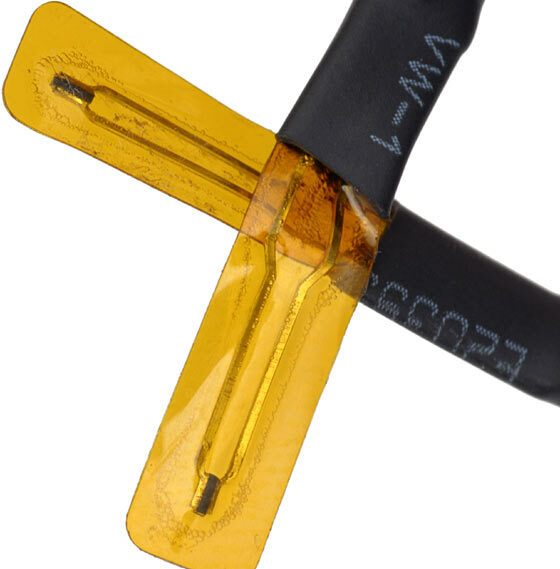 The probes are the standard ultra-slim flexible type, suitable for insertion in various nooks and crannies, but not for sandwiching between a CPU and its heat sink. Anything other than a smear of heatsink grease between a CPU and its cooler will foul up the thermal transfer. You get stickers and attachment tape with the Panel kit, so it's easy to stick the probes anywhere they're meant to go. The 5.25 inch Panels have all this, and more. Send no money now. 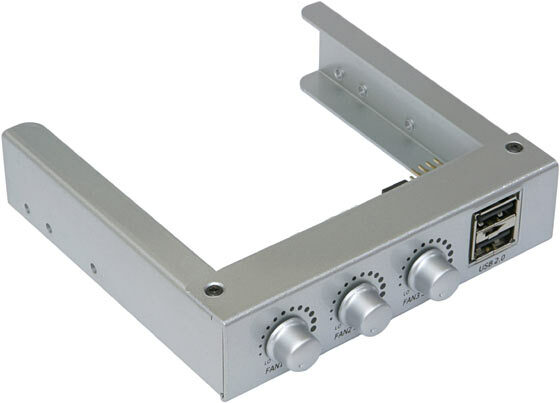 In addition to the loopback USB and FireWire connectors, they've got three 1/8th inch stereo audio connectors, which are meant to be used for Line In, Line Out and Mic, but can be connected to any output you like on your sound card, or any other 1/8th-inch-stereo-socketed device the loopback cables can reach. 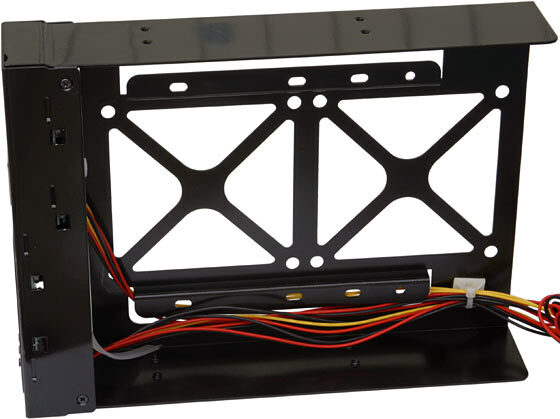 The larger Panels also have these screw-hole-bedecked rear trays, in which you can install two 80mm fans, or one 3.5 inch hard drive. 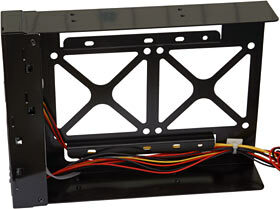 Installing fans here isn't likely to achieve a great deal unless there's a vent above or below the Panel, but the drive mount location could be handy. Apart from the addition of the audio loopback cables, the cables for the 5.25 inch Panels are the same as the 3.5 inch ones. All of the cable connectors, by the way, are labeled and keyed to make it difficult to connect anything incorrectly. The operating display of the 5.25 inch Panel. 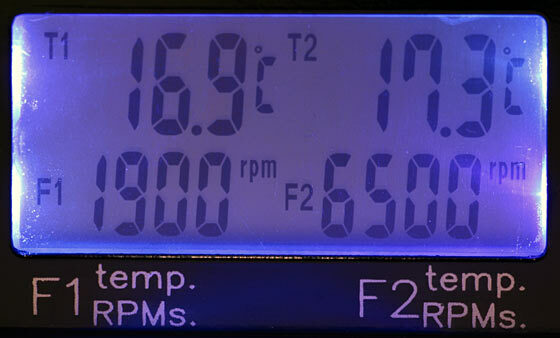 Two temperature readouts, two fan speeds, all displayed at once. The displayed temperature resolution is 0.1 degrees (don't ask awkward questions about whether the actual sensor hardware is that finely calibrated); the fan speed resolution is 100RPM. The fan speed sample rate is low, somewhere between one update every five seconds and one update every ten; that's more than good enough for the purpose, though. 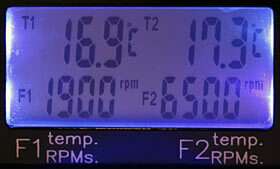 The temperature sample rate is around one update every three seconds, which is also amply fast. Because the display's edge-lit, it doesn't have the even illumination of a screen with an electroluminescent sheet behind it. It's bright blue on the edges, and darker and greener in the middle, where the natural colour of the cheap LCD shows through. The display for the 3.5 inch Panels is the same, except it's only got room to show one temperature and fan speed at a time. To switch between displaying set 1 and set 2, you press the Mode button. In operation, the Panels work pretty much as you'd expect, except for one letdown. There are alarms for both temperature and fan speed, with configurable threshold values for each; both fan alarms, and both temperature alarms, can be set independently. The alarm's a simple high pitched beeping reminiscent of a really cheap electric alarm clock. It does the job. You can set the alarm range for temperature between 40 and 80°C, in 5°C increments; the alarm range for fan speed is between 1000 and 5000RPM, in 1000RPM increments. You set the alarm thresholds in a manner reminiscent of setting a digital watch; hold down the Mode button to go into setting mode, then use the Mode and Set buttons to change the settings, then hold down Mode again to return to run mode. All this is close to useless, though, because the Panel only remembers its settings while it's powered up. Turn off the computer and the Panel will return to its default configuration, with both temperature alarms set to 45°C and both fan alarms set to 1000RPM. If these settings suit you, or you never turn your computer off (and have it connected to a UPS...), then there's no problem. But the alarm configurability is otherwise pretty much a non-feature, unless you like the idea of having something to do while your computer boots. On the plus side, the Panels worked fine with a variety of low, medium and high power fans. The only one that caused any problems was a hefty 6.8 watt 120mm Sunon unit, which caused all of the Panels' displays to go blank whenever it was plugged in. It spun fine, and they came back on perfectly happily when I unplugged it, so I don't know what the problem was. The Panels were fine with smaller fans that had higher power ratings. The Panels also notice when there's no fan attached to one or both of their channels, and don't sound an alarm about that. Whenever they do see a fan on one of their channels, and then it slows down below the threshold, though, the alarm sounds. So you can power a Panel up with no fans connected and then connect a fan, and it'll start monitoring it normally. But if you start up with a jammed fan that never starts spinning, the Panel will never know. And so, to the fan controller. Two front USB ports, three fan speed knobs. 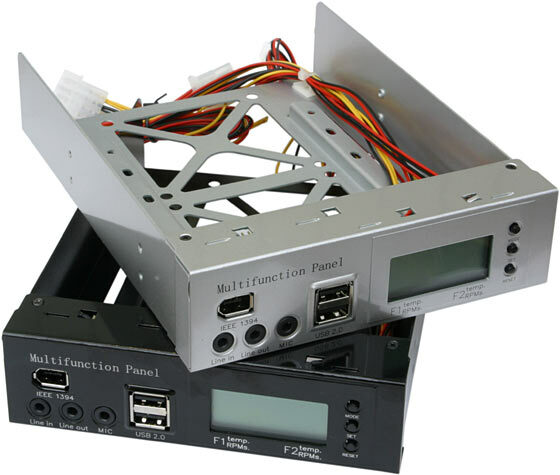 The Multi-Function Panels don't have any fan speed control features; they just monitor the speed of the fans. This thing can control the speed of three fans, from 12 volts (full speed) to 6 volts. 6 volts won't give you half speed, by the way. Brushless DC computer fans don't act as pure resistive loads, but they're closer to that than they are to anything else, so halving their input load actually gives you roughly quarter power. Many fans will still spin from only six volts, and be practically silent while they're doing it. A few fans will keep spinning at six volts, but need a bit more to get started. Some fans will just coast to a halt if you turn them down to 6V. 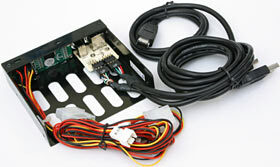 The fan controller runs from the same passthrough power adapter as the Multi-Function Panels; the power wire is about 30cm long. Its three 3-pin-socket fan cables are about 50cm long, which should be quite enough; it's also got a lengthy 70cm USB port lead. This lead isn't a loopback cable like the leads for the Multi-Function Panels; it terminates in eight single-pin micro-plugs, which you have to attach to the USB headers that pretty much all motherboards have these days. There's more than one pinout for the headers, but your mobo manual ought to tell you which one your board uses, and the micro-plugs are labeled. The controller also comes with a pair of passthrough four-to-three-pin fan adapters, which you can't actually use with it, but which will allow you to plug in two more three-wire fans without losing any PSU plugs. 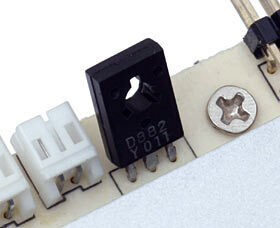 The fan throttling grunt work is done by three of these components - D882 transistors in a TO-126 package. The controller is rated at ten watts per channel, and the specs I've got for brand name D882s say that's the maximum total power for them, so I reckon the off-brand D882s the controller uses are the same. Ten watts is more than all but the most outrageous 12 volt fans draw. Most "high power" 60 and 80mm fans (the ones that'll give you a gash and a broken fan blade if you're courageous enough to stick your finger into them) have run powers of little more than five watts. Seven, at the outside. There's a catch, however. These transistors can only manage their full rated power if their case temperature is kept down to 25 degrees Celsius. In this little bay, that's not going to happen unless the principal purpose of the fan being controlled is to keep its transistor cool. If you want to run high powered fans, you're going to have to add your own heat sinks to the transistors, at the very least. This is not a new phenomenon; there are lots of "fan bus" products that go up in smoke if you use them with beefy fans. The problem arises when you turn the speed down; the speed control hardware, whether it's a simple variable resistor or an active system like this one, behaves more or less like a simple wire when the throttle's turned up. Not much voltage drop, not much heat, no problems. The further down you turn the speed, though, the more power the controller will have to dissipate. I tested the GTR controller with a couple of fans which each have roughly seven watt nominal power. Nominal power is usually how much a fan draws when it's spinning up; its run power will generally be lower. With a Y.S. Tech nominal 7.2 watt fan, a thermal probe expertly clothes-pegged to the metal back face of one of the transistors read 39°C, with an ambient temperature of 16°C, with the fan at full power. Winding the fan down to minimum speed kicked the temperature up fast; it hit 90°C in less than 40 seconds, at which point the rate of climb wasn't slowing down much. I terminated the experiment there. The magic smoke would definitely have escaped from the transistor after less than another minute. When powering a nominal-2.9-watt Sunon fan, which is a good middle-of-the-road medium power case fan, the probe on the transistor stabilised at 69°C, 52 degrees above ambient. That's rather warm, but perfectly safe; the maximum operating temperature for these transistors is likely to be up around 150°C, at which point the thermal probe (not in terribly good thermal contact with the chip package) would probably be reading 130 degrees or so. So this "ten watt per channel" controller is actually good for maybe four watts per channel. With a bit of a breeze over it - which it won't get, in many 3.5 inch drive bays - it could probably do five just fine. And the less you turn your fans down, the more power capacity the controller has; you could run a twenty watt fan from it with no trouble, as long as you hardly turned it down at all! Most motherboards these days have at least two onboard fan headers, and fan and temperature monitoring hardware's common too. Tweakers often want more fans, and want to be able to monitor and control them, and that section of the market may quite like these "GTR" gadgets. They're not stupidly expensive for what they are. Front ports, OK display, reasonable feature set, pretty nice to look at. As I discovered, though, there are some caveats. Whatever brand name these things are sold under where you live, don't believe the hype. Aus PC Market no longer stocks these products, but they've got lots of other case modding gear!